One of my favorite features of the Kindle is the dictionary look up with the 5 way controller. Not only does the Kindle arrive pre-loaded with The New Oxford American Dictionary that you can access like any other ebook, you can also look up a word from the ebook you are reading, without leaving the book. This is a feature I rapidly fell in love with. So much so, that when I now read regular paperbooks, my thumb automatically reaches for the 5-way when I reach a word I don't understand! For this feature alone, I'd miss my Kindle if I went back to regular books. Simply enough... when you come across a word you want to know more about, you use your 5-way to scroll up/down, left/right until you reach the word. At the bottom of the screen, a small box appears with a definition. 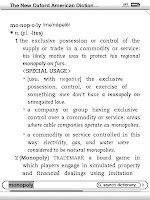 In my example here, I scrolled to the word Monopoly. If the definition at the bottom doesn't seem to be enough, I might want to know more. If you want to know more about the word, you click the enter button to take you to relevant page in the dictionary. After clicking enter, you will now be within the dictionary and can read more definitions of the word (see image below). At that point, if you have what you want, you can click the "Back" button to return to your ebook. If however you want more information, you can use your current placing within the dictionary to look up more information or search elsewhere. 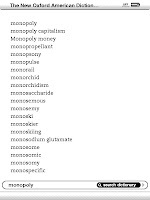 If you look at the bottom of the screen in my image above, you will see the look-up word Monopoly still at the bottom. Move your 5-way to the right where it shows "search dictionary". This now opens the dictionary on the index where I might find more relevant entries in the dictionary & I can scroll to them. 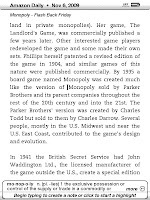 For my word Monopoly, there's also Monopoly capitalism and Monopoly money. If that's not enough for you, keep moving your 5 way until you get more selections! For the latter 3 options, you will need your Whispernet turned on so just click Menu & turn it on. Click the option you want & wait for the relevant page to open. Note that at any time you want to get back to your ebook, you can click the back button. Personally I think this a fantastic & very valuable feature on the Kindle. With a paperbook, I can rarely be bothered to get out my dictionary but this makes it so easy that I do it all the time. Even with words I already know, I often use it to double check meanings or learn more about the words themselves.